Latest News: The package of major LCP amendment requests authorized to be submitted to the California Coastal Commission by City Council Resolution No. 2017-56, including relaxed height restrictions, a new power for the the Community Development Director to waive the public hearing requirement for CDP applications that he deems to involve “minor” development, and the City’s request to be able to grant variances from and modifications to the development standards certified by the CCC, have now been approved with the exception of a request to weaken protections against shoreline armoring. The City Council accepted the amended language at its February 12, 2019, meeting, with final adoption on February 26 and certification by the CCC on April 11. Meanwhile, as Item 13 on its January 22, 2019, agenda, the Council accepted the revisions to its Accessory Dwelling Units policies and regulations approved by the Coastal Commission on October 12, 2018. And on April 9 the Council approve submitting to the Coastal Commission a new amendment request to eliminate the off-street parking requirements for many businesses in Balboa Village. Background: The Newport Beach Local Coastal Program sets policies and detailed rules for issuing Coastal Development Permits, which are the main mechanism for ensuring activities within the Coastal Zone of the City comply with the California Coastal Act. 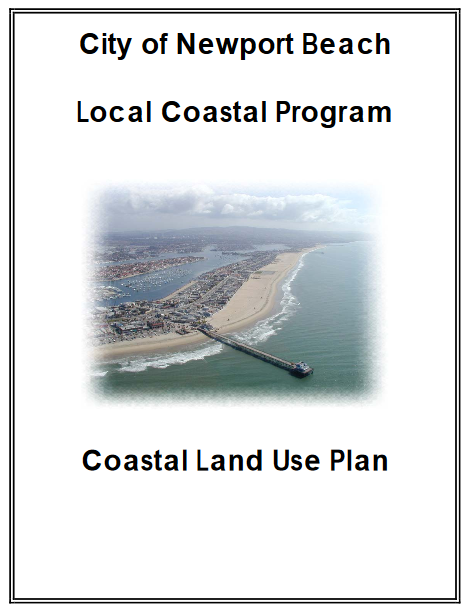 The Newport Beach Coastal Land Use Plan, a CCC-certified general policy document last adopted and amended by City Council Resolution No. 2009-53. The Implementation Plan, a CCC-certified set of detailed regulations made part of the Newport Beach Municipal Code by City Council Ordinance No. 2016-19. The certified IP, Title 21 of the NBMC, is a modified version of the original proposal submitted to the CCC by the City Council with Resolution No. 2015-99 on November 10, 2015. The Council’s proposal was heard by the CCC at its September 8, 2016, meeting in Newport Beach (Item 21c). The modifications suggested by the CCC on September 8 and ultimately accepted by the City Council can be seen in the report for Item 11 from the Council’s November 7, 2016, meeting. A Coastal Zone Boundary Map and a Post-LCP Certification Permit and Appeal Jurisdiction Map produced and approved by the CCC, which delineate the areas within which the CCC is the original issuer of CDP’s and the areas within which those approved by the City can be appealed to the CCC. The Implementation Plan review process included minor adjustments to the City’s Coastal Zone Boundary, approved by the CCC at its April 14, 2016, meeting (Item 11a). The current appeals map was approved by the CCC at its March 8, 2017, meeting (Item 21a). A Categorical Exclusion Order CE-5-NPB-16-1, adopted by the CCC on November 4, 2016, (Item 16a) which exempts certain kinds of residential construction in certain areas from CDP requirements. The City has a FAQ explaining the “Cat Ex”, as well as a list of development that has been deemed eligible for it. Changes to any of the above require approval by the CCC. Project Overview: Effective January 30, 2017, some 45 years after passage of the voter-enacted precursor to California’s Coastal Act (1972’s Proposition 20), the City of Newport Beach finally, and for the first time, obtained a fully certified Local Coastal Program authorizing it to process and issue such permits. But the ink was barely dry on the LCP, when it became apparent a raft of seemingly staff-generated amendments was being rushed to approval with very little public awareness. Proposed changes to the LCP are sometimes, but not always or in any systematic way, noticed on the City’s Implementation Plan page. Why We’re Watching: SPON is very concerned both with the process and with the substance of the proposed amendments. The process is especially difficult to follow since their seems to be negotiation between City and Coastal Commission staff, out of the public eye. In addition, because the number of requests is large, trying to keep track of them, and their status, is difficult. In all cases, if a City proposal is amended by the Coastal Commission at their hearing, possibly as a result of the private negotiations, the Council would have to agree to the CCC’s amendments or abandon the proposals. Originally consisted of nine unrelated insertions and deletions. Submitted to the CCC by City Council Resolution No. 2017-45 on July 11, 2017, after removal of a controversial staff proposal to exempt “planned communities” from the long-standing 35-foot height limitation in the “Shoreline Height Limitation Zone” from the foot of the coastal bluffs to the sea. Apparently on advice of Coastal Commission staff, three of the proposals were resubmitted as “major” LCP amendments (see next item) on September 12, 2017. Coastal staff placed approval of the remaining proposals as Item Th11a on the Commission’s November 9, 2017, agenda, but was granted up to a year to complete processing, including considering if more of the “minor” proposals were, in fact, “major” amendments. The parts culled out for the November 2017 meeting were approved, with modified recommendations, as Item 22a at the Commission’s July 11, 2018, meeting, contingent upon City acceptance of the changes. The City Council introduced the ordinance making the changes at its September 25 meeting (Item 19). The most significant change as a result of these “clean ups” is that the Community Development Director will be able to waive the public hearing requirement for CDP’s for what he deems to be “minor” development. However, anyone objecting to that decision can ask for the public hearing to be held. As a result of confusion about the CCC-recommended changes, the ordinance implement the “minor” revisions had to be reintroduced by the Council on October 23 (Item 11), and was adopted by the Council on November 13 (Item 3). The Coastal Commission certified the adequacy of the City’s action on December 12, 2018 (Item 24c). Note: Because of rules governing how many LCP amendment requests can be submitted in a calendar year, the following three items that had previously been submitted to the CCC separately (“Clean-up,” “Encroachments” and “ADUs”) were resubmitted as a single “major” LCP amendment request with City Council Resolution No. 2017-56. The package was deemed complete on May 3, 2018. Three of the items removed from the earlier “minor” clean-up package of Resolution No. 2017-45 were re-submitted as part of City Council Resolution No. 2017-56 on September 12, 2017. As Item 15 at its February 12, 2019, meeting, the City Council adopted a resolution modifying the Coastal Land Use Plan as approved by the CCC and introduced an ordinance accepting and incorporating the Implementation Plan changes. Final adoption occurred as Item 5 on the February 26 consent calendar. The Coastal Commission certified the changes on April 11. This is a proposal to allow the yards of private homes abutting the beach from Balboa Village to the Wedge to legally encroach out onto the beach, similar to what is currently allowed in West Newport. The proposal was formally submitted to the Coastal Commission by City Council Resolution No. 2017-50 on July 25, 2017, and then resubmitted as part of Resolution No. 2017-56 on September 12, 2017. This is a proposal to amend the LCP Implementation to align with changes recently made to corresponding sections of the Zoning Code in response to a new state law. The proposal was formally submitted to the Coastal Commission by City Council Resolution No. 2017-51 on July 25, 2017, and then resubmitted as part of Resolution No. 2017-56 on September 12, 2017. When the CCC staff report for October 12, 2018 (Item 15b), was posted, it magically included most of the changes proposed by Council Resolution No. 2018-65 (without acknowledging those had been formally submitted). That hybrid amendment (which may or may not agree with the City’s final Zoning Code changes) was approved by the CCC and is awaiting acceptance by the City Council. The Council accepted the modified policies and recommendations as Item 13 on its January 22, 2019, agenda, with final adoption of February 12. The Coastal Commission certified the amendments on April 11. On a separate track from the other “minor” amendments to the LCP, the City has pending a request to correct what it regards as “errors” in the setback maps that are included as exhibits in the LCP-IP. This mirrors corrections previously made to the identical maps in the Zoning Code, and will affect eight inland parcels on Lido Isle. The request was heard and approved by the Coastal Commission on September 14, 2018. According to an email from Newport Beach Planning Manager Patrick Alford, the City has asked the Coastal Commission’s mapping unit to redraw the appeal boundary to move five properties from Coastal Commission permit jurisdiction to City jurisdiction. That is, to allow the City to approve permits for development on those properties, subject to appeal to the Coastal Commission. See what appears to the CCC’s official “Post LCP Certification Permit and Appeal Jurisdiction” map on the LCP Address Lookup & Maps page. The City’s understanding of the boundary locations can be seen more clearly using, under “Layers,” the “Community Development Layers“…”Local Coast Program“…”Permit and Appeal Jurisdiction” options in its zoomable online GIS Map Viewer. The areas of original CCC jurisdiction are those in the hatched “Permit Jurisdiction Area,” seaward of the shaded “Appeal Jurisdiction” area (where City approvals can be appealed to the CCC). The City’s mapping of tidelands can be found under “Public Works Layers“…”Harbor Resources Layers“…”Tidelands Survey“. The five properties the City asked to take jurisdiction over were the Newport Harbor Yacht Club, Balboa Bay Club, Sea Scout Base, OC Harbor Patrol/USCG station and Newport Aquatic Center. It is unclear when or if this request was authorized by the City Council or how it was noticed to the public. In its original proposal for the Implementation Program, submitted to the CCC with Resolution No. 2015-99, the City had offered its own understanding of the appeals map, as shown on pages 472, 473 and 474, as well as a map of its Public Trust Lands, on page 476. Those maps did not appear to include the presently requested exclusions. The Coastal Commission was scheduled to hear the request as Item 10a on its Friday May 11, 2018, agenda. According to the agenda, such changes can be allowed “pursuant to Coastal Act Section 30613.” Ultimately, the item was postponed without a staff report being posted. The request reappeared, with full staff report and supporting documentation, as Item 23a on the Commission’s July 11 agenda. CCC staff recommended approving the Sea Scout Base request, rejecting the Aquatic Center request and retaining control of the sandy beaches at the Balboa Bay Club, the Coast Guard/Harbor Patrol Station and the Newport Harbor Yacht Club. The Coastal Commission rejected pleas from the City’s lobbyist to take control of the beaches, and approved the transfers of jurisdiction as recommended by their staff. However, the Commission appears to have ceded permitting authority for the bulkheads to the City. A later “clarification” from CCC staff indicates the Commission transferred jurisdiction over the “land” to the seaward edge of bulkheads, but not to the bulkheads themselves (since they are subject to wave action). The proposed amendment (the details of which were, curiously, not shown) would exempt homes with floor area ratios of 2 on lots of 4,000 square feet and less from the need to apply for a Coastal Development Permit. The current limit for such homes is 1.5. The matter had not previously been discussed. The change was unanimously approved as part of the CCC’s August 10, 2018, agenda, where it was Item F21a, and accepted by the City Council at their September 11, 2018, meeting. The Coastal Zone portion of Newport Coast has its own LCP, created by the County of Orange prior to that area’s annexation by the City and still administered by them. As Item 12 on its July 25, 2017, agenda, the City Council directed City staff to begin work on adding Newport Coast to the City’s LCP. The proposal is still a City staff level effort and nothing has been formally presented to the CCC. This could prove very problematic considering the large quantity of unbuilt allocations. According to the July 25 staff report, that includes 182 homes, 1,046 hotel rooms and 75,933 square feet of commercial development. SPON is, therefore, watching with concern. This would purportedly allow the City to approve permits for construction and activities in the water areas of the harbor, which all currently require approval by the Coastal Commission. Details remain sketchy, but if this ever happened, it would presumably require changes to the LCP to incorporate the Port Master Plan. In 2015, with Ordinance No. 2014-20, the City Council made changes to the Zoning Code (Newport Beach Municipal Code Title 20) creating the overlay district. However, and despite the City apparently not thinking such action needed Coastal Commission approval, the City was at that time negotiating its LCP Implementation Plan, which generally shadows the Zoning Code, and the Coastal Commission deleted the corresponding language from it (see CCC suggested modifications, as presented at the special November 7, 2016, City Council meeting). A major Coastal Act concern is that marine-related and visitor-attracting businesses appear to be treated less favorably than others. Pursuant to Section 21.28.030.D of the IP, creation of the parking overlay district will require an amendment to the IP. Although we believe City staff has been in contact with CCC staff about this, we have been unable to find a Council resolution authorizing submission of a formal request to the Coastal Commission. On December 20, 2018, City staff posted an announcement that on February 12, 2019, it will be asking the City Council for permission to submit to the Coastal Commission a request to add language to the Local Coastal Program creating the Balboa Village Parking Management Overlay District. The proposed language appears to be identical to that added to the Zoning Code in 2015 and rejected by the Coastal Commission in 2016. The City re-noticed the matter for a hearing before the Planning Commission on February 21, 2019, and on April 9, 2019 the City Council approved submitting the amendments to the Coastal Commission. Closely related to the Balboa Village Parking Management District request, this is a proposal to initiate a residents-only parking program (or “RP3“) in the area west of Balboa Village to cope with the increased demand expected from the Parking Management District. Prior to having a certified LCP, and the local permit approval authority that goes with it, the City Council, pursuant to Item 14 at the Council’s October 27, 2015, meeting, directed City staff to file an application for a permit parking Coastal Development Permit with the Coastal Commission, but the application seems never to have gone anywhere. Now that the City has a fully certified LCP, it claims it can, consistent with the LCP, approve the CDP itself — although it believes that approval would likely be appealed to the Coastal Commission. Coastal Commission staff appears to disagree with this, and believes the creation of new Preferential Parking Zones anywhere within the City’s Coastal Zone would first require an amendment to the LCP, which would have to be approved by the CCC. Indeed, City-proposed language that would have allowed approval of CDP’s for PPZ’s was not included in the certified LCP (see the CCC modifications as presented and accepted by the Council at a special November 7, 2016, meeting). See also page 12 of the CCC staff report regarding their Post LCP Certification Permit and Appeal Jurisdiction Map, Item W21a at the CCC’s March 8, 2017, meeting, in which the CCC acceded to allowing parts of the interiors of Balboa and Lido Islands to be placed outside the CCC appeal area based, in part, on their understanding that restrictive parking programs could not be created there without an amendment to the LCP. Before considering approving a CDP on its own, City staff attempted to re-assess residents’ interest in the program at a community meeting held at Marina Park on May 7, 2018. Based on the mixed results obtained there (mostly against the proposal), City staff promised to conduct a new mailed survey. Based on the new survey (which showed close to 50% opposition), and the likelihood of appeal and rejection by the CCC, City staff announced that its plans to establish an “RP3” have been permanently shelved. This appears to be a follow-up to the sea level rise and flood adaptation concerns presented to the Council at its January 22, 2019, study session (see next to last slide of Item SS4 PowerPoint presentation). The staff work necessary to prepare the amendment was unanimously initiated by the City Council as part of agenda Item 16 on March 26, 2019. At a date yet to be determined, the Coastal Commission is expected to hear the City’s request to create a Balboa Village Parking Management Overlay District. April 10, 2019: Meeting in Salinas, the Coastal Commission accepted the City’s implementation of two previously-approved matters: Item 16.1a confirmed the Council’s February 12, 2019, LCP amendment adding new regulations for Accessory Dwelling Units. Item 16.1b confirmed the Council’s February 12 and 26, 2019, amendments that add exceptions to the Shoreline Height Limit and include a new provision allowing for modifications and variances and allow additions to nonconforming structures. April 9, 2019: As Item 13 on its agenda, the City Council directed staff to submit to the Coastal Commission a proposal for amendments to the Local Coastal Program Implementation Plan to create a Balboa Village Parking Management Overlay District, exempting most businesses in Balboa Village from the requirement to provide off-street parking (see notice). March 26, 2019: As part of agenda Item 16, the City Council directed staff to ask the City Council to prepare revisions to the LCP and Zoning Code amendments to create new development standards for low-lying areas subject to flood hazards. February 26, 2019: As Item 5 on the consent calendar, the City Council adopted the ordinance introduced on February 12, incorporating CCC-approved major amendments into the City’s Implementation Plan. February 21, 2019: The Planning Commission approved a resolution recommending the City Council approve staff’s request to ask the CCC to amend the LCP to create a Balboa Village Parking Management Overlay District, eliminating the need for most businesses in that area to provide off-street parking. note: A previous City announcement, indicated this would be going directly to the City Council on February 12. Both state law and the existing Implementation Plan require the matter first be reviewed by the City’s Planning Commission. February 12, 2019: As Item 15 at its February 12, 2019, meeting, the City Council adopted a resolution modifying the Coastal Land Use Plan as approved by the CCC on December 12 and introduced an ordinance accepting and making the CCC-approved major amendments to the Implementation Plan. Final adoption of the ordinance is expected on February 26. January 22, 2019: As Item 13 on its agenda, the Council introduced ordinances to enact the modified policies and regulations regarding Accessory Dwelling Units approved by the CCC on October 12, 2018, and to make corresponding changes to the local Zoning Code. December 20, 2018: City staff posts an announcement that on February 12, 2019, it will be asking the City Council for permission to submit to the Coastal Commission a request to add language to the Local Coastal Program creating a Balboa Village Parking Management Overlay District (something that is already in the City’s Zoning Code, but not in its certified LCP Implementation Plan). December 13, 2018: Although not directly an LCP amendment request by the City, on December 13, while the CCC was meeting in the Council Chambers, the City’s Zoning Administrator approved a Coastal Development Permit establishing a permit parking system for residents of the “Finley Tract” (across Newport Blvd. from the old City Hall site and Lido Village). Such a CDP approval by the City flies in the face of the CCC’s understanding that such restricted parking zones cannot be established without an amendment to the LCP (see discussion of the since-shelved Balboa Area Residential Permit Parking Program, above). December 12, 2018: The California Coastal Commission held its three-day monthly meeting in the Newport Beach City Council Chambers. Item 24b on the Wednesday agenda was consideration of “major” requested amendments to the City’s Local Coastal Program. See staff report and exhibits, supplemented by correspondence and an addendum. The amendments, as modified by Coastal Commission staff, were approved, with three Commissioners voting “no.” As Item 24c, the Commission certified the City’s implementation of the “minor” revisions adopted by the Council on November 13. October 23, 2018: The City Council introduce an ordinance accepting the “minor” changes to the LCP approved by the CCC on July 11. This had been planned for October 9, but was rescheduled. October 12, 2018: Coastal Commission approved modified regulations regarding Accessory Dwelling Units at its meeting in San Diego. Those now have to be accepted by the City. October 9, 2018: The City Council was scheduled to introduce the ordinance accepting the “minor” LCP amendments approved by the CCC at their July 11 meeting in Scotts Valley. However, the version transmitted to the City by CCC staff did not match the version approved on July 11. As a result, Council action was rescheduled for October 23. September 25, 2018: The City Council accepted the CCC’s approval of its requests for “minor” amendments to the LCP as granted at the CCC’s July 11 meeting. September 14, 2018: As Item 7.1 on its agenda, the Coastal Commission approved a City request to correct “errors” in the setback maps that are part of the LCP. This was regarded as a “minor amendment,” and affected eight inland parcels on Lido Isle. September 11, 2018: The City Council accepted the modified Categorical Exclusion Order (see August 10, 2018, below), and adopted resolution requesting additional changes to the regulations in the LCP regarding accessory dwelling units. August 10, 2018: In the interest of “governmental efficiency,” the Coastal Commission unanimously approved the City’s request to expand its Categorical Exclusion Order. This was Item F21a on the agenda. July 11, 2018: Most of the “Minor LCP Clean-up” package first considered on November 9, 2017 (but now billed as “Major”), as well as the boundary change request (previously noticed for May 11, 2018), were heard and approved (with CCC staff modifications) on the Coastal Commission’s July 11 agenda as Items 22a and 23a. June 8, 2018: As Item F9a on its agenda, the Coastal Commission granted its staff an up-to-one-year extension of time to review the City’s package of “major” LCP amendment requests. The City’s “coastal advocate,” Don Schmitz, spoke on the item, and told the Commission the City had been promised that despite the extension, the parts of its “major amendments” package other than the Peninsula Point beachfront encroachments would be ready for action at the August meeting. May 11, 2018: As Item 10a on its Friday May 11 agenda, the Coastal Commission was scheduled to hear the “City/CCC Jurisdictional Boundary Change Request” (see “Why We’re Watching,” above), but the item has been postponed. May 8, 2018: Item 6, approved on the May 8 City Council Consent Calendar, was an unexpected request to amend the City’s “Categorical Exclusion Order.” The proposed amendment (the details of which were, curiously, not shown) would exempt homes with floor area ratios of 2 on lots of 4,000 square feet and less from the need to apply for a Coastal Development Permit. The current limit for such homes is 1.5. The matter had not previously been discussed. The change would have to be approved by the CCC. May 7, 2018: At 6:00 p.m. at Marina Park, City staff held a community meeting to reassess interest in establishing a Residential Permit Parking Program for the area west of Balboa Village (a CDP application having been formerly submitted to the CCC per Item 14 at the Council’s October 27, 2015, meeting, but never completed). With many attendees opposed to the proposal, promises were made to conduct a new “stakeholder” survey. Should the City choose to go ahead with the “RP3,” it says it could now issue its own CDP, but its approval would likely be appealed to the CCC. CCC staff appears to believe a CCC-approved amendment to the certified Implementation Plan would be necessary before any CDP for a new parking program could be approved. November 9, 2017: The California Coastal Commission granted staff a continuance of up to a year to further consider the package of “minor” LCP amendments submitted by the City. Much less time than that is expected, but a rehearing date has not yet been set. To recap, the Coastal Commission announced that as Item Th11a at its hearing in Bodega Bay on November 9, the Commission would be reviewing their Executive Director’s declaration of the “minor” portions of the City’s July 11, 2017, submittal — which would, in the absence of objection by the Commission, be deemed approved. However, Coastal staff has asked for the entire matter to be taken temporarily off calendar, and nothing has yet been approved. An exhibit to the CCC’s November 9 staff report showed the City’s Resolution No. 2017-45 with the parts deemed “not minor” by CCC staff crossed out. However, of the parts being deemed “minor,” proposed Amendment #2 would create relaxed development standards for a Lido Villas Planned Community, and Amendment #12 would eliminate the need for public hearing on many Coastal Development Permits. The crossed out parts include all the worrisome language the City proposed on July 11 changing the height limit rules. Since that language is not in the September 12 repackaging and consolidation of “major” amendments, it appears the City is not pursuing a relaxation of the height limits, at least for the moment. For those having trouble accessing the November 9 CCC files, they consist of a report, an exhibit (the City requests) and an addendum (asking for the continuation to a later meeting). September 12, 2017: Staff returned to the Council with a report that the City was in danger of exceeding the number of major amendments to the LCP allowed in a single calendar year. The CCC’s rule apparently allows multiple major amendments if they are part of a single submittal. As a result, in Item 3 on the consent calendar, City staff asked the Council to adopt Resolution No. 2017-56, which combined in a single submittal the Oceanfront Encroachment and Accessory Dwelling Unit proposals from July 25 with three proposals from July 11 that the CCC had deemed “major” (regarding shoreline protective devices, allowing a 75% expansion of nonconforming residential structures, and establishing rules for deviations from the development standards via variances and modifications). The staff report did not identify which portions of the July 11 proposal had been deemed “minor,” requiring only the CCC Director’s approval. However, Resolution No. 2017-56 submits none of the language creating new exceptions to the City’s building height limits, suggesting that request has been dropped. In addition, the status remains unclear for a Parking Management District in Balboa Village (removing any requirement for businesses to provide off-street parking), which seems to have not been formally submitted at all. As Item 18, the Council adopted Resolution No. 2017-50, submitting to the CCC a proposed amendment to the LCP to allow beach encroachments in the Peninsula Point area. As part of Item 19, Resolution No. 2017-51 submitted an amendment allowing Accessory Dwelling Units. As Item 12 on the consent calendar, the Council agreed to “Initiate amendments to the City’s certified Local Coastal Program and the Newport Coast Planned Community Development Plan to incorporate Newport Coast into the City’s certified Local Coastal Program. ” Little more is known of this latter proposal, as it does not appear to have been the subject of any other public discussion. July 11, 2017: As Item 10 at its evening meeting, the City Council heard the “clean-up” portion of the proposed LCP amendments, including a provision that would have exempted planned communities from the City’s longstanding height limits, even in the so-called 35′ Shoreline Height Limit Area. The Council questioned that proposal and asked staff to come back with a revised “clean-up” eliminating that proposal. The matter did not come back, but the resulting Resolution No. 2017-45, as signed by the Mayor, differed from the one presented to the Council in the Item 10 staff report by having the planned community exception removed. May 18, 2017: At the Corona del Mar Residents Association‘s monthly meeting, the City’s Community Development Director, Kimberly Brandt, and Deputy Director, Brenda Wisneski, gave a presentation entitled “Local Coastal Plan Amendments (Shoreline Properties) & future General Plan Update Project” (see the agenda). Regarding the LCP Amendments, Ms. Wisneski indicated that despite the Newport Beach Planning Commission’s action on May 4 (recommending Council approve the flawed amendment package exactly as presented by staff), instead of sending the proposal directly to the City Council, City staff is working with the Coastal Commission staff in Long Beach to figure out what might actually fly (before it becomes effective, whatever amendments the Council approves have to be certified by the Coastal Commission, which looks to their own staff to spot problems with them). She anticipated this process might take several months, but did not explain exactly what would happen at the end of it. That is, would a revised set of amendments be brought back to the Planning Commission for public re-consideration? Or (as happened with the original LCP) would the Council adopt City staff’s (flawed) package, but with a forewarning (based on the staff discussions) of what parts the Coastal Commission would likely change or reject? Apparently time will tell. May 4, 2017: The amendments were re-noticed for a hearing before the Planning Commission as Item 3 on May 4. At that hearing, it seemed apparent most of the Commissioners either had not reviewed the item in advance of the meeting, or were not interested in it. Despite the many flaws pointed out to them (see above under “Why We’re Watching”), on a 5:1 vote (with Commissioner Lawler absent and Commissioner Weigand voting “no”) the Commission, without any substantive comment or any revisions at all, recommended the Council approve all the amendments as submitted. As indicated in a SPON letter, the Parking Management plan prioritizes resident-serving commercial uses over marine-related ones, in contradiction of Coastal Act policies. The Encroachment Program introduces new regulations into the Implementation Plan that permit development in areas where it is explicitly prohibited by the governing Land Use Plan. The “Clean-up,” among other contradictions, deletes the Coastal Commission approved Land Use Plan policy exceptions that allowed the Lido House Hotel (being built at the old City Hall site) to rise to 65 feet in a 35-foot height limitation zone, but retains the Implementation Plan regulations allowing such excess heights (now without explanation or justification). On a separate track, City staff proposed amending both the Zoning Code and the LCP to accommodate what they say are changes required by new state laws in the City’s rules for “Accessory Dwelling Units” (small rental units) in single-family neighborhoods. This was heard as Item 2 at the Planning Commission’s May 4, 2017, meeting. The Commission showed more interest in this than the other amendments, and voted to continue the item until they had more time to study it. April 11, 2017: With little to no prior public awareness, action by the Council on the LCP amendments was scheduled for a public hearing as Item 18 on the April 11 agenda. As a result of reminders from the public that Council action was not legally allowed without a Planning Commission recommendation (as required by Table 21.50-1 in the newly certified Implementation Plan), the item was withdrawn. Explanation of Local Coastal Program on City’s website. Original Notice of Availability of review copies of amendment texts. New Notice of Availability of review copies of amendment texts. Notice of Availability of Accessory Dwelling Unit amendment text. This entry was posted in News, Watch List and tagged height limitations, Land Use, lcp, local coastal program, shoreline height limitiation zone on April 2, 2017 by Jim Mosher.